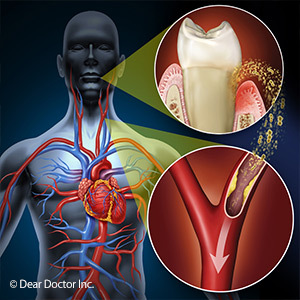 Is there a link between periodontal (gum) disease and cardiovascular disease? Medical researchers are endeavoring to answer this intriguing question, but early findings seem to say yes. If it bears true, the findings could advance treatment for both diseases. There is one thing that can be said for certain: inflammation is a factor in both diseases’ progression. Gum disease begins as an infection caused by bacteria growing in plaque, which is made up of bacteria and a thin film of food remnant that adheres to tooth surfaces. The body responds to this infection through tissue inflammation, an attempt to prevent the infection from spreading. Likewise, inflammation appears to be a similar response to changes in blood vessels afflicted by cardiovascular disease. While inflammation is part of the body’s mechanism to heal traumatized tissue, if it becomes chronic it can actually have a damaging effect on the tissues intended to benefit. For patients with gum disease, chronic inflammation causes connective tissues to detach from teeth, leading eventually to tooth and bone loss. Similarly, inflammation damages the linings of blood vessels in cardiovascular disease patients. Researchers want to know what role bacteria may also play in the progression of cardiovascular disease. Initial studies seem to indicate that proactively treating the gum disease by removing all plaque from oral surfaces in patients with both conditions does appear to improve the health of diseased blood vessel linings. Whether this could ultimately reduce the occurrence of heart attack or stroke still needs to be ascertained. As we learn more about the possible connections between these two diseases, there’s hope it will lead to new advancements that could improve health outcomes for both. It may prove to be the case, then, that maintaining a healthy mouth promotes a healthy heart, and vice-versa.